Those who would rather laugh than weep will not miss seeing "Excuse Me," the Rupert Hughes production, which comes to Loew's State next Saturday, January 17th. There are taxi-cab wrecks, there are train smash-ups; thereare aeroplane flights. This is a case of smallpox which starts the characters in the story off all wrong. There is a boy, a girl, a marriage license, a wedding, ring, but no visible minister to marry them. For three days and three nights, during the time a train is ploughing across country, they are put in a compromising position by occupying the same drawing room. There never before has been a comedy just like it, for practically all of the players were drawn from drama, though the production itself contains only farce comedy roles, and the situations throughout are humorous and unusual. Conrad Nagel, popular leading man of the screen's dramatic artists, plays the role of Harry Mallory, a young naval lieutenant. Beautiful Norma Shearer is seen in the role of Marjorie Newton, having her initial fling in a comedy role, though in a sense Majorie (sic) is a pathetic little character. Renee Adoree, as Francine, the French girl, is a character of mystery. Some of the most important scenes revolve about her. She, too, has heretofore been identified only with the more serious dramatic roles. Walter Hiers, in blackface, as the colored porter, has some very funny scenes, and the rest of the cast featured includes Bert Roach, William V. Mong and Edith Yorke. "Excuse Me, Suh" WALTER HIERS as the Pullman porter in "Excuse Me," coming to LOEW'S STATE next SATURDAY, Jan. 17th. "Just Married" CONRAD NAGEL and NORMA SHEARER in "Excuse Me," coming next Saturday, Jan. 17th. Edwin H. Flagg ... Tech. Direc. W. B. Jackson ... Stage Direc. Hubbard Robinson ... Art Direc. Willard Fife ... Chief Projec. "He Who Gets Slapped," Victor Seastrom's triumphant picturization of the famous Leonid Andreyev play, is having its Western premier at the Criterion Theatre. This unusual film has caused no end of comment, both from the standpoint of its author's brilliancy and the fact that is serves to bring Lon Chaney to the screen in the greatest protrayal of his entire career. Besides Chaney, there are other well known players in the cast, such as Norma Shearer, John Gilbert, Tully Marshall, Marc McDermott, Paulette Duval, Clyde Cook, Ford Sterling, George Davis, and Brandon Hurst. A notable surrounding program has been arranged which includes a novel film, "The Phantom Ballet," a Felix the Cat cartoon, "Felix Finishes First," a Van Bibber comedy, "The Burglar," and a novel stage presentation and the Criterion Symphonists conducted by George Stolberg. Like all theatrical folk, Rupert Hughes, whose production of "Excuse me" comes to Loew's State next Saturday, has definite opinions on the subject of superstitions. He deliberately walks under ladders, claiming to find it much less crowded there. "Excuse Me," his most uproarious comedy, was completed in just under thirteen days. In order to give it a lucky start, the play was given its out-of-town try-out on Friday, the 13th of January, 1911 and made its Broadway debut on February 13th. And now he has transferred the play to the screen just thirteen years later. "Excuse Me" is the epic of the Pullman car. The heroine is Marjorie newton, a delightfully feminine society debutante, played by Norma Shearer. The hero is a young naval officer, Harry Mallory, portrayed by Conrad Nagel. The famous Pullman porter has been given into the hands of Walter Hiers, and the fascinating french girl, Francine, is played by rene Adoree. Bert Roach as the traveling salesman, Jimmy Wellington, leaves much comedy in his wake, and William V. Mong as the meek minister is importantly featured. CONRAD NAGEL as "Harry Mallory," young naval lieutenant, and Renee Adoree as "Francine," the French girl, in "EXCUSE ME," coming next SATURDAY. PULLMAN TRAIN ONE FEATURE OF "EXCUSE ME"
A Pullman train always offers a great study in types. People from all walks of life drift into them; "city slickers," small town rubes, society dowagers and film flappers become fellow passengers and equals on a cross-country car. 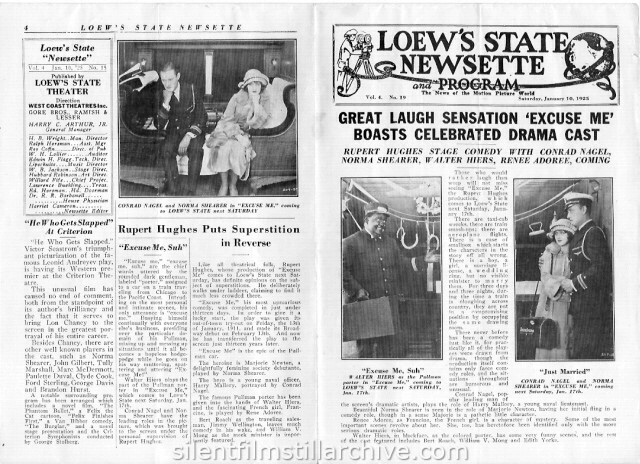 So "Excuse Me," the Rupert Hughes production which comes to Loew's State next Saturday, January 17th, features a transcontinental Pullman train. Starting at Chicago and ending in San Francisco, all the scenes of importance take place during those three days within the train. As types we find first the handsome naval officer, Harry Mallory, played by Conrad nagel, hurrying to catch a transport which is sailing from San Francisco for the Philippines. With him is Marjorie Newton, his affianced bride (Norma Shearer). They have a marriage license and a wedding ring, but fate alone has prevented them from having a minister tie the final and fatal knot before they enter the train. There is the Pullman porter, who knows everyone's business. Walter Heirs plays this important role. The bewitching French girl, Francine, is played by Renee Adoree, who, with her small son, proves to be the trouble-maker of the trip. The minister and his pensive wife are there. Ther former is played by William V. Mong and the latter by Edith Yorke. Besides these are the usual occupants one finds on every train. A colorful Journey to Nashville, Tenn.
LATEST HAMILTON COMEDY ON BILL WITH "EXCUSE ME"
In conjunction with the showing of "Excuse Me," Rupert Hughes' celebrated comedy-drama stage success, which has been brought to the screen under the supervision of this famous writer, in which many dramatic stars appear for the first time in comedy rolees, Loew's State Theatre, starting next Saturday, January 17th, will offer to its patrons the latest two-reel Lloyd Hamilton comedy, "Crushed." "Crushed" is claimed to be the funniest comedy Hamilton has ever made. Ths big, fair-haired boy is one of the cleverest of the present day comedians, and his familiar characterization of the unsophisticated country boy is familiar to all theatre-goers. In this picture hsis again the country boy who goes to the city, and hs side-splitting experiences in the subway rush form the basis of a great part of the comedy. In addition, there are numerous sequences as clever, which in themselves lift the pictre far out of the class of the ordinary run of comedies. 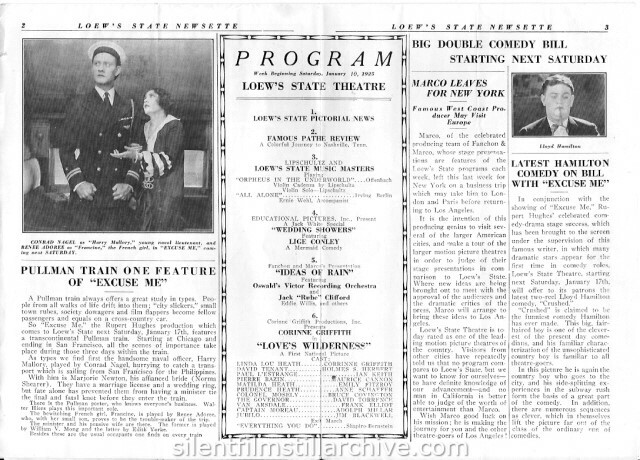 [NOTE: Printed on the flip side of this program is the Screen News for the California Theatre and Miller's Theater program from the same week. Click here to read that program.